Diabetes is a medical condition that has wide-ranging effects on the entire body. Given the increased risk of blindness, heart attack, and stroke from the disease, it can be easy to look past how diabetes can affect your feet. This is a mistake, however, and Charcot foot is a major reason why. Dr. Kevin Powers will work with you to establish a diabetic foot care plan that enables you to recognize problems at their earliest, most treatable stages. Even better, your plan establishes guidelines that—when followed diligently—reduce your risk of serious medical issues. A good starting point for right now is to learn about Charcot foot, including what the condition is, why it happens, and how it can be treated. If you are unfamiliar with Charcot foot, this is a condition that begins when weakened bones in the foot break easily. Continued, normal use leads to further breaking, and this continues until the foot has eventually changed shape and appears severely deformed. You might think you would easily notice a broken bone in your foot, but this isn’t necessarily the case if you have neuropathy (nerve damage). Neuropathy can cause painful burning and tingling sensations, but it may also inhibit your ability to feel sensations like temperature or pain. When numbness is in the picture, you can likely see how Charcot foot can develop and worsen without you noticing. If you have the nerve damage that frequently accompanies diabetes, it is imperative to inspect your feet on a daily basis and take measures to protect them from injury. When a fracture goes unnoticed, you will likely continue walking in a normal fashion, which places substantial pressure on the foot and leads to further breakage. This all culminates in a change of shape for the affected foot as the joints lose their integrity. The deformity can lead to disability and even require amputation in certain cases. The major warning sign of this condition is the fact you have diabetes. There are numerous reasons to have a comprehensive diabetic foot care plan, and the risk of Charcot foot is certainly one. As noted, your risk is heightened if nerve damage accompanies the disease. In addition to diabetic neuropathy, having a tight Achilles tendon can further increase your risk factor. Pain as a symptom may seem contradictory to the concept of neuropathy, but nerve damage can exist without affecting all of the nerves in your foot. If you suspect that you have fractured a bone in your foot, or if you are observing any of the symptoms listed above, call our office as soon as possible. Catching the issue early goes a long way towards successful treatment of this serious condition. After Dr. Powers has studied your medical history and noted your symptoms, he will physically examine your foot and use diagnostic imaging tests to arrive at a diagnosis. Changing you activity levels – Charcot foot can develop in both feet, so it is important to avoid overuse injuries that can lead to this condition. Understandably, this may require changes to your usual routines and physical activities. Immobilizing affected feet – The initial wave of treatment is centered on keeping weight off the feet (when the condition is discovered at an early stage). This may be accomplished in some cases by using a wheelchair or other medical device. 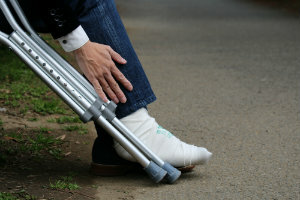 In time, the wheelchair may be substituted by a cast, brace, or boot. These methods allow the weak bones to heal themselves. Prescription braces and shoes – Once Dr. Powers approves a regular activity level, following the repair of your bones, orthotics and special shoes can be used to protect your foot and prevent ulcers or other complications that arise from improper footwear.